In a hidden room in the back of a pier overlooking the San Francisco Bay, a young girl shoots glitter across the room with a flick of her wrist. On the other side of the room, a boy is shooting darts from his wrist – some traveling at least 20ft high, onto a landing above. It feels like a superhero training center or a party for the next generation of X-Men and, in a way, it is. This is Superhero Cyborgs, an event that brings six children together with 3D design specialists and augmentation experts to create unique prosthetics that will turn each child into a kind of superhero. The children are aged between 10 and 15 and all have upper-limb differences, having either been born without a hand or having lost a limb. They are spending five days with prosthetics experts and a design team from 3D software firm Autodesk, creating prosthetics that turn a replacement hand into something much more special. “We started asking: ‘Why are we trying to replicate the functionality of a hand?’ when we could really do anything. Things that are way cooler that hands aren’t able to do,” says Kate Ganim, co-founder and co-director at KidMob, the nonprofit group that organised this project in partnership with San Rafael, California 3D software firm Autodesk. KidMob first ran this type of project at Rhode Island’s Brown University in 2014. KidMob’s previous projects have included designing a fence for a school and creating a youth center for an area devastated by a typhoon. The group recently applied to work on the XQ Super School Project to rethink US high schools, funded by the late Steve Jobs’ wife, Laurene Powell Jobs. 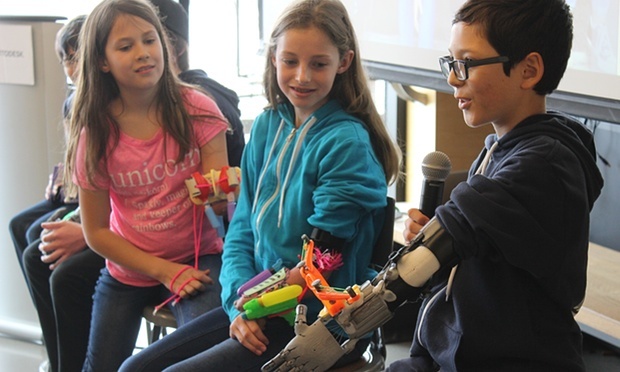 KidMob conceived the Superhero Cyborg project after discovering RoboHand, an open-source design for a prosthetic hand that anyone can 3D print at home. While the hand serves a purpose, its functionality is limited and it looks like a cyborg attachment rather than a traditional hand. Instead of thinking of a missing limb as a disability, the Superhero Cyborgs project re-frames it as an opportunity. If you don’t have a hand, then you can have anything – it’s a blank slate. At the end of the project, the children showed off their creations to Autodesk employees and were paired with a mentor that could help them refine their idea over the next few months. “The goal for them is to really prototype and walk away with a working design model, or one that is really close that they can continue on with,” says Sarah O’Rourke, a marketing manager at Autodesk and Superhero Cyborgs project lead. Details of each superhero prosthetic are being posted on the DIY site Instructables and hacking site Project Ignite in the hope that it inspires other groups, schools and individuals to follow suit. “A classroom might work on building a project and then donate a finished hand to someone they know or appoint it to someone in the community who is in need,” O’Rourke said.